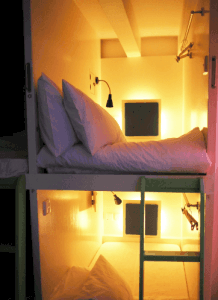 Matchbox Concept Hostel In Singapore Review – Dorms are not exactly known to give you much privacy – you sleep together with a bunch of strangers in squeaky bunk beds while someone else’s sweaty feet climb the little ladder on the side of the bed next to your face, and wherever you look you’re facing someone else in a bed in front of you. Well, there is a different sort of bunk bed system which is becoming more and more popular around the world, that claims to tackle some of these annoyances: pod beds. 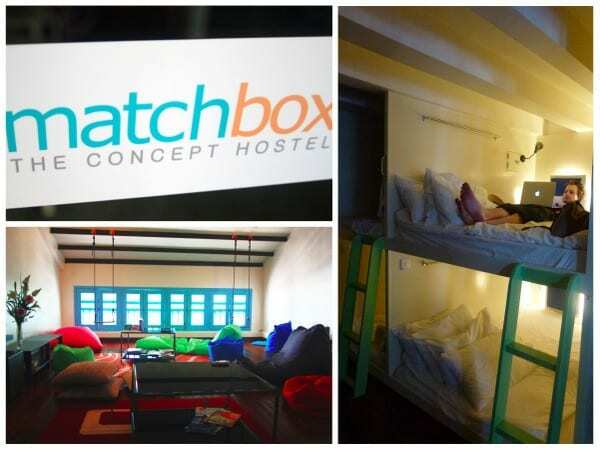 We had never tried this concept before, and were curious to see how different a dorm experience would be with pod beds – so we decided to check out Matchbox The Concept Hostel, which is one of the most popular hostels in Singapore. Matchbox is one of the new “upmarket hostels” that are emerging in Singapore, catering to so-called “flashpackers”, although I have to say they’re keeping their prices quite reasonable when it comes to Singapore accommodation. 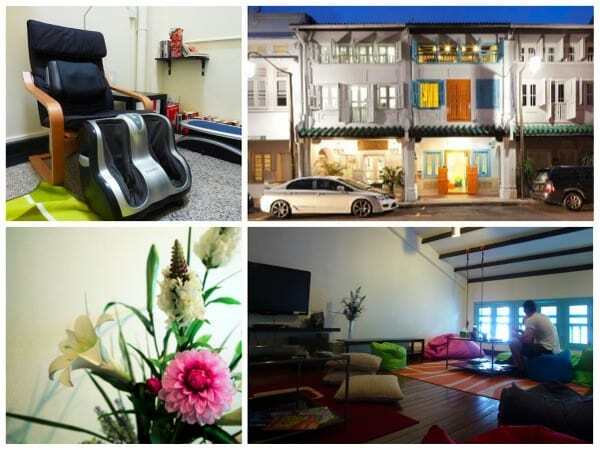 While the hostel is in a historical shophouse, the interior is refurbished into a very modern and immaculately clean place. With foot and back massager, cardio exerciser, washing and drying machines, all-day breakfast and a large pantry with designer bean bags, board games and a big plasma TV with DVD’s – you feel right at home. Super fast wifi spans throughout the hostel (or you can use their laptops for free if you don’t have one), there is an iPod docking station in every room, and a nice and quiet A/C. The greatest thing about the hostel is that all of the above, plus towels and other extras, are included in the price – there are no annoying hidden extras and add-ons. So you sleep in a type of capsule/pod bed cabin, giving you that well needed private space, your own little “crib”, where you can hang out and sleep undisturbed. There are three room types to choose from; a 2 bed dorm, 10 bed female dorm and 16 bed mixed dorm – there are two types of pod cabins, the single pod and the double pod which is the size of a queen size bed. We slept in a queen size bed on the upper bunk, and there was plenty of room for both of us. It was actually very cozy, and it reminded me slightly of one of those tree houses you always dreamed to have as a kid. With each cabin having its own lights and reading lights, the light of the dorm was very isolated, so nobody would disturb you if they woke up early, or if you slept in. The bed was super comfy, with thick duvets and plush custom designed pillows to snuggle up in. Tucked away on Ann Siang Road, a smaller street in the heritage district of Chinatown, the location couldn’t have been better. 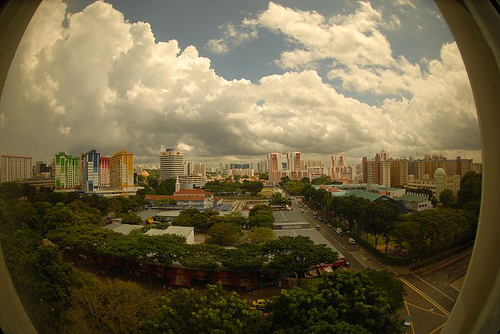 Close to both fancy bars and cheap restaurants, night markets and shopping centers, it’s a great place to embrace the Chinese culture of Singapore, and being close to bus stops and the MRT station in Chinatown, it’s easy to get around the city from there. Next time you’re in Singapore, I’d definitely recommend you to check out this place! During our week in Singapore, we found it to be a very exciting place to visit. The country has gone to many lengths to encourage tourists to visit, and since everything was so easy to reach you could manage to do a lot of things in a short period of time – in other words, a perfect place to visit for only 1 week. 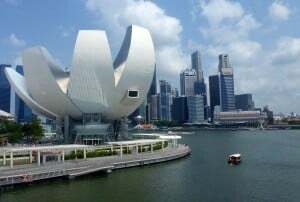 A modern metropolis, Singapore is incredibly well-structured, organised and yes, it is true that you get fined for spitting on the street, littering and chewing gum on the train! What you would think is just common sense, is a strict law in Singapore, but because of this the city is cleaner and greener than any other cosmopolitan city we’ve visited in South East Asia. You’re not even allowed to drive a car that’s older than 10 years, so everything truly is brand new. One of the main reasons people choose Singapore as a holiday destination is because of its shopping opportunities – and you can take full advantage of these on a short break or stop-over. Orchard Road is considered the most famous shopping district with haute couture labels and fantastic window displays. If you happen to be in the country during a major celebration, then store sales will definitely be in your favour. Due to the tropical heat, Singapore has plenty of mega malls which will have you shopping hours on end without breaking a sweat. Although, we all know that local markets are much more authentic and exciting. The best time to visit the markets is in the evening – walking through the market in China Town in midday is like a sweaty concrete jungle and with the smell of Peking duck and smoked pork, it can get a little overpowering at the best of times. For cheaper alternatives, Little India has some shopping malls, markets and boutiques that are worth a look. With a wide variety of different cultures, it is the people that really make the city what it is today as flickers of traditional designs and customs still peek through this modern day metropolis. With Little India, Chinatown and Arab Street, you feel like you’re exploring several different countries in one day – only a cleaner version of “the real thing”. All of these areas have their own charm, delicious food and local handicrafts typical for their culture – my favorite, however, was Arab Street and its surrounding alleys, absolutely amazing! With the city growing and updating itself at rapid speed, the trend for modern buildings, including unique holiday accommodation, is forever increasing to new levels. The newest instalment to the city’s skyline is the Marina Bay Sands Skypark. Or as I like to say, ‘The Floating Boat’. A hotel, casino and club, this is where people are starting to base themselves for a long night out. Walk along the bay, and watch the “laser light and water show” at night, which aims to capture the essence of Singapore (Sunday to Thursday at 8pm and 9:30pm, Fridays and Saturdays at 8pm, 9:30pm and 11pm). Capturing the skyline of Singapore is definitely a “must-do”, but you’ll find that the city is much more than just high rise buildings. There are a huge number of green parks around the city, and the amazing Botanical Garden was one of our favorites to get away from the hustle and bustle of the city. For those who are in the city for less than a day, Singapore’s tourism industry has put together a bus tour around the city’s major sights. Although the airport is ranked as one of the best in the world and more than equipped for those who are on quite a long stop-over, having a quick city tour set up is great. We did the Hop On – Hop Off tour to faster get around the city to the places we wanted to explore, and we found it to be very useful. Singapore, like many other Asian countries, is known for its hospitality and true love of children. Many families choose to holiday in Singapore, as there is always an essence of safety and welcoming in the air. If you do decide to take your next family getaway to Singapore, you won’t be short on fun things to do, with theme parks, zoos and widespread gardens to keep you entertained. When heading out with the kids, be sure to check out these great, family-friendly places in Singapore. Lunching with lions and incredible night safaris pretty much sums up what the Singapore Zoo and Safari Park is all about. With admission less than $10 for children, this is an affordable day out and a great experience for kids of all ages. Have a fun day out with your children, while teaching them a thing or two about hundreds of different animal species – this is truly a day out that the whole family will enjoy. Theme parks are always a favourite with kids and, as far as Singapore goes, this is the best. The ultimate water park, Wild Wild Wet provides children and families with a fun-filled day out! Thrills and Excitement will be had by all as you race down ‘The Waterworks’ at lightning fast speeds or grab the whole family and take the ultimate super flume ride on the ‘Ular-Lah’. Wild Wild Wet is perfect for kids of all ages (even the big kids at heart!) with shallow areas and play equipment, suitable for all ages. Make your kids feel like superheros as they glide 165 metres above the ground, in the world’s largest observatory wheel. This 20 minute ride is exhilarating and provides the most spectacular views of the city skyline. Coming face to face with some of the rarest and most deadly marine wildlife in the world is sure to be an exciting day. Let your kids explore this underwater journey, through tunnels and ever changing exhibitions of fish, sharks, turtles and manta rays. Let your kids experience the colour and beauty of nature as they watch more than 380 species of gracious bird wildlife. While the park covers a great area of space, there is also an air-conditioned monorail, so you can enjoy the wonders of the park without tired (and sometimes whiny) children. 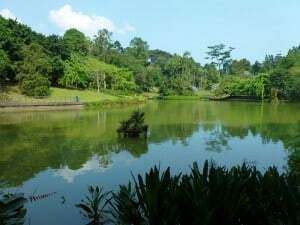 Most things in Singapore won’t open until around 11am, so if you’re up early and your kids are ready to go, why not go for a stroll through the Botanical Gardens, completing a lovely morning with a picnic by the lake. World renowned for providing visitors with a consistently amazing experience, Universal Studios Singapore will not disappoint. Whether you’re a bit of a movie buff or just want to get amongst the action of Jurassic Park, you’re bound to have a blast at Universal Studios Singapore. When travelling from Australia, it’s easy to find cheap flights to Singapore, so why not make this your next family adventure? While there’s plenty of things to see and do for the kids, parents will also love this unique and unforgettable holiday destination. Looks like a cool concept. As a reader, I wish you would include the price (or at least a range) when doing posts like these… I was able to dig it up, but with a shoddy internet connection it is a pain. It’s always good to know if it’s somewhere I could reasonably afford to stay before going through the whole article. I’ve always wanted to stay here since the first time I passed by this place! Glad to see the ‘inside’ of it through your photos. 😀 Will def recommend it to friends coming over. Yeah it looks so inviting from outside doesn’t it! Great to hear you’ll be recommending it to your friends, they won’t be disappointed. Reminds me of this hostel thats in Singapore as well. I haven’t stayed at this one as it’s the new one but I stayed at the old one and was my first pod hostel I ever slept in. I LOVED and it’s still been one of the best hostels I have ever been at in all my travels. thanks for the comment, yes they have set the rooms up perfectly! All you had to say was ‘concept’ and I was interested. I’m always on the lookout for something out-of-the-norm, something a little bit different, and these photos show it to be just that. Must keep this page saved somewhere so that I can make it there myself someday. We didn’t stay at the Winkhostel, but it seems very similar, thanks for the tip! Great to hear! We thought these pod style dorms were such a great solution to providing some privacy, definitely recommend this place if you visit Singapore.